all mine! : Who did this? wow.. that looks pretty good! what about the plasmoids? do they also change some colors? atm i don't have the time to try this out... would be great to see that too! ..Hey! Just noticed: do you configure the global shortcuts in same dialog as the regular shortcuts in the new dialog? When talking about KDE4, you hear great stuff like Phonon, Plasma etc. 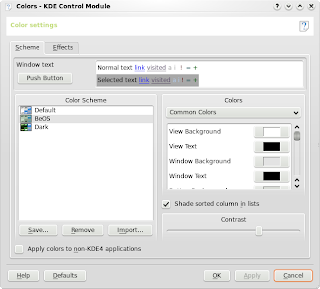 - sure, I look forward to try those too; but, almost even more, I want to see a more polished KDE, getting rid of these small annoying things. 1. 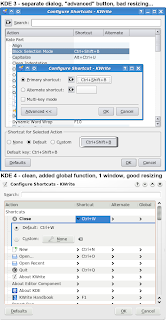 It didn't make any sense to me first - I was looking for "Game controls" or something similar, but (after searching for a while) found them in "Configure shortcuts". a) To set your controls, you have to search for the game controls, use the mouse to set it (if you don't know alt+u) and then continue scanning the list. b) If there's a keyboard based game, you want to look up the controls before playing for the first time. Well, the shortcuts dialog makes that harder than it has to be: first you have to realize that the game controls are in fact in the shortcuts dialog, then you have to find the game controls in the long list of shortcuts - there is even a high risk that you miss some controls that you use in the game (especially with controls without the prefix ”Player” (which some multiplayer games have), given the fact that the shortcuts are sorted alphabetically) . This makes the game much less enjoyable, which is sad for many of the great games out there, so I hope to some improvement in KDE4. First, grouping in the shortcuts dialog would make life a little easier - do you know if it's supported? Sorry for the long post, and most of it being off topic. Maybe I should post this on a mailing list? @Hans: Imho this dialog is really much better. It takes a sec to figure out how it works, but it is rather intuitive. I'm not too sure about the games thing. On one hand, consistency is important. But yeah, the actions in games are kind'a special, they might deserve a specific configurationspot. Maybe something should be done in the games-library so the games can use it. Or the normal shortcut dialog should allow for grouping, so you can put the actions on top or something. Maelcum (on IRC) is the owner of those kudos !! The Oxygen widget style just keeps getting more beautiful. I still don't think the scroll/progress bars fit in though. @Robert: well, I actually like the scrollbars a lot, more than the ones you normally see. I love the glows in dark colorschemes. 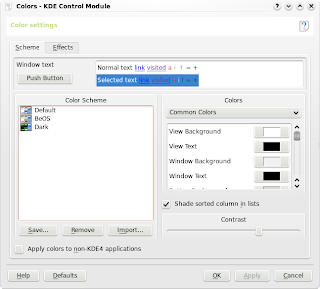 I don't know any Maelcum in IRC, but judging from kde-commits and personal memory this should correspond to Andreas Hartmetz who also tidied up global shortcuts for KDE 4 (among other things). He did the major work on the shortcuts dialog. I really like that new Oxygen style and how it fits with dark themes, really impressing. And i noticed that there are even new menu where user selects what part like to change. When i saw this, two things came up to my mind. 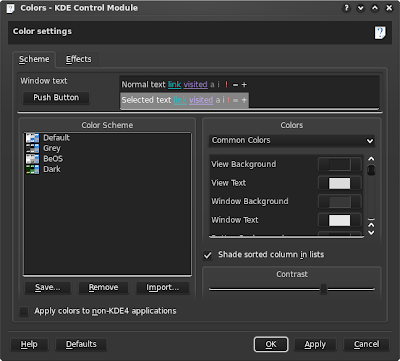 b) Is there coming more options to choose what color is used in wich place? Like i really love customize options and choosing colors is one of them. Like can i choose different color for menu text and window text or is it still related to together so if i have dark theme, i want red menu text and white window text, i can do it or like on current situation, i have red or white in both places? 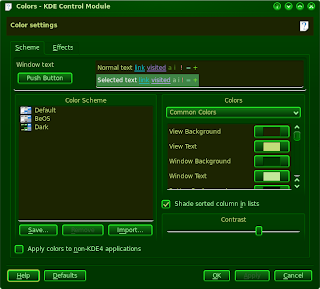 And I don't know if KOffice follows these colors, but if they don't, you should file a bug.